lso-product curves show the various possible combinations with which a given level of output can be produced. Thus. iso-product curve shows the technical conditions of production. On the other hand. 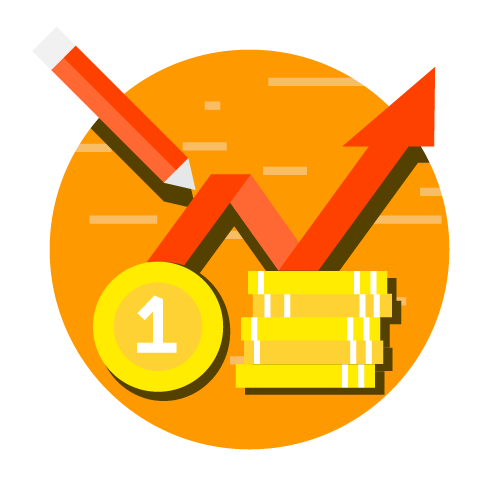 iso-cost lines represent total amount uf outlay to be spent and the ratio of the prices of the two factors. Now the question arises: which combination of factors a producer will choose to produce a given level of output? In other words. 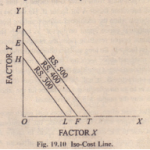 at what point on the iso-product map the producer will he in equilibrium regarding the factor combination, given the level of output to he -produced. This can be illustrated with Fig. IY.II. We assume that the producer wants to produce a given level of output as cheaply as possible, because in doing so his profits will he maximized.In other word’. the producer will bIy to strike a least-cost commutation of facials to produce a given level of output. Suppose a producer has decided to produce 60 units of a product. 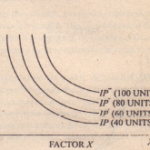 60 units of the product can be produced by any of the combinations such as R, S, Q. which lie on the iso-product curve II” in Fig. IY.6. He will choose that combination on the iso-product curve II” which gives him Ihe lowest cost of production for the production 014>0 units of the product. From Fig. 19.6. it will be clear that the produce will choose combination Q at which isu-cut line IlL is tangent to the iso-product curve Ip. Combination Q will cost the producer least lor producing 60 units of output. The producer will not choose any other combination on iso-produce] curve IP’ such as R. S, because all these lie on the higher iso-cost line (EF) than iso-cost line UL and will. therefore, mean greater total outlay for producing 60 units of output. The producer will not go tire left of Q. for he will nut be able to produce (! () units of output by any combination which lic.\ to the lclt or Q on II” . Hence. we conclude that the producer will be in equilibrium h) choosing the factor combination Q tu produce 60 units of the output. 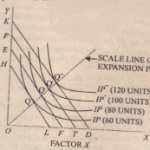 Factor combination Q is an optimal l1 factor combination for him to produce 60 units of output.output. Th it is so because factor combination Q will give him the lowest cost of production. Millisecond of TS and Price Retail. It will be evident from Figure J9.6 that at point Q marginal rate if technical] substitution will be equal to the ratio of prices of the factors. 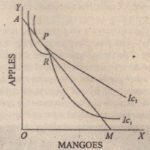 Marginal rate of technical substitution is given hy the slope of the iso-product curve and the price ratio of the factors is given by the slope of the iso cost line. The slope of the iso-product curve JP’ and the iso-cost line HL arc equal at the point of tangent Q. and the marginal rate of technical substitutions (M RTS) will be equal to the price-ratiu of factors X and Y at point Q. This means that the producer will ~hum etc one factor for another in search of the cheapest llc tho of production until the prices ratio and the marginal rate of technical substitution are approximately equal.